Microsoft Excel offers many chart types and many chart effects, but sooner or later you'll want to do something that Excel doesn't offer. Many effects can be accomplished through the use of extra series and clever formatting. For example, you might want a customized axis style, or a line or shape drawn in a particular position, or text labels that are tied into axis values. Several of these tricks with dummy series are adaptations of Tushar Mehta's Flexible Log Scale Axis technique, from his web site, http://www.tushar-mehta.com. While custom labeling of dummy series points can be done manually, most of these tricks rely on Rob Bovey's XY Chart Labeler, a free add-in available for download at http://www.appspro.com, or John Walkenbach's JWalk Chart Tools, another free addin from http://j-walk.com/ss/excel. Want to place multiple lines on a chart, but separate them so you can visualize all at once? This page contains instructions and an example worksheet and chart that show an approach with offsets built into the series, plus formatting tricks to dress it up. A more comprehensive treatment of this technique, covering line, column, and area charts, is given in Stacked Charts With Vertical Separation. 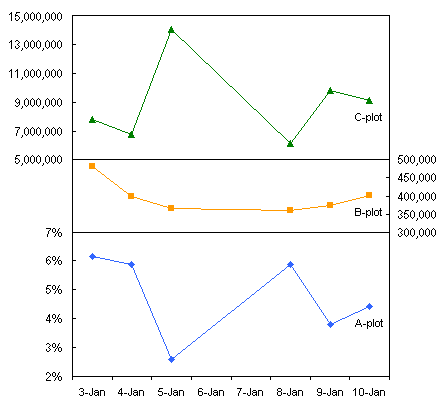 Add a Horizontal or Vertical Line to a Column or Line Chart. How do you add a horizontal or vertical line to a column or line chart, to show a target value, or the series average? The method involves adding a new series, applying it to the secondary axes, and making the secondary axes disappear. A variation uses an error bar for the straight line, rather than the connecting line between two points. Add a Horizontal Line to a Column or Line Chart: Series Method. Add a Vertical Line to a Column or Line Chart: Series Method. Add a Horizontal Line to a Column or Line Chart: Error Bar Method. Add a Vertical Line to a Column or Line Chart: Error Bar Method. Special Format for Minimum and Maximum. Ever want to apply special formatting to just a certain point? This example shows you how to highlight the minimum and maximum values of a series by using a different marker for each, and data labels. We'll accomplish this with two extra series in the chart, one for minimum and one for maximum. Chart with Colored Quadrant Background. I was recently asked, "I have an XY scatter chart that gets divided into 4 quadrants and each quadrant needs a different color. Any ideas?" I love a good challenge, so I came up with the procedure in this page. This page shows how to put a vertical band on a chart, highlighting a certain region. The technique can be used, for example, to highlight a certain time period in the background of a gantt chart. Some kinds of data look very nice and are easily understood in the form of a "floating" column or bar, in which the column floats in the chart, spanning a region from a minimum value to a maximum value. Excel Waterfall Charts (Bridge Charts). Waterfall charts are a special type of Floating Column Charts. 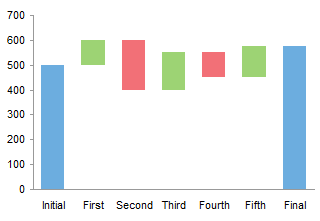 A typical waterfall chart shows how an initial value is increased and decreased by a series of intermediate values, leading to a final value. An invisible column keeps the increases and decreases linked to the heights of the previous columns. This page shows how to arrange your data and create a waterfall chart in Excel. Control Bubble Chart Bubble Sizes. In Microsoft Excel's bubble charts, bubble sizes are fixed according to the largest bubble in the chart. This is a problem when comparing multiple charts that have dissimilar bubble size data. This article shows an easy way to link the bubble size scales of charts with different bubble size data.